Discussion in 'Off Topic' started by Judge, Apr 15, 2019 at 12:23 PM. Looks bad. Media presently referring to it as an "out-of-control" fire. Heartbreaking. :O I hope they can save it. Amazing medieval building. Sincerely hoping they put out the blaze soon and that no-one is hurt. Out of curiosity, are there any sprinkler systems or other preventative measures against fires installed for stuff like this? I doubt it'll be gone forever - stuff like 3D printing and other new technologies are helping today to keep other historical artifacts and sites alive. I remember seeing a program (I think it was "How Stuff Works", "How It's Made" or a similar program to that effect) which showed 3D printing been used to create an impressive replica of an ancient Japanese artwork that was becoming too old to openly show in public due to risk of damage. The same could potentially be done for Notre Dame. Flames have almost entirely engulfed the main spire in the center of the roof. If it should collapse fall through the roof, there's no telling what could happen relative to the rest of the structure. Media cites the height of the structure as being inaccessible to firefighters. Haven't heard of anyone reporting that the building was sprinklered. But it's very evident that renovations were taking place. Media speculating that the fire might have occurred as a result of construction operations given the degree of the building literally crumbling over the years. Oh no! Thoughts and prayers to everyone. They just showed the spire collapsing inwards into the rest of the building. I can only guess that most of the main portion inside the cathedral is now gutted. Tragic. 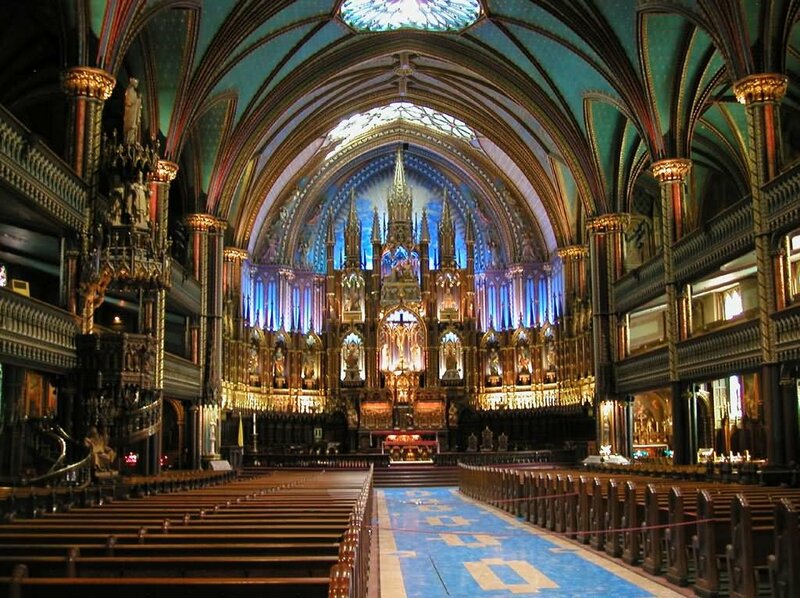 I mean, I don't think there is a more iconic example of Gothic architecture. 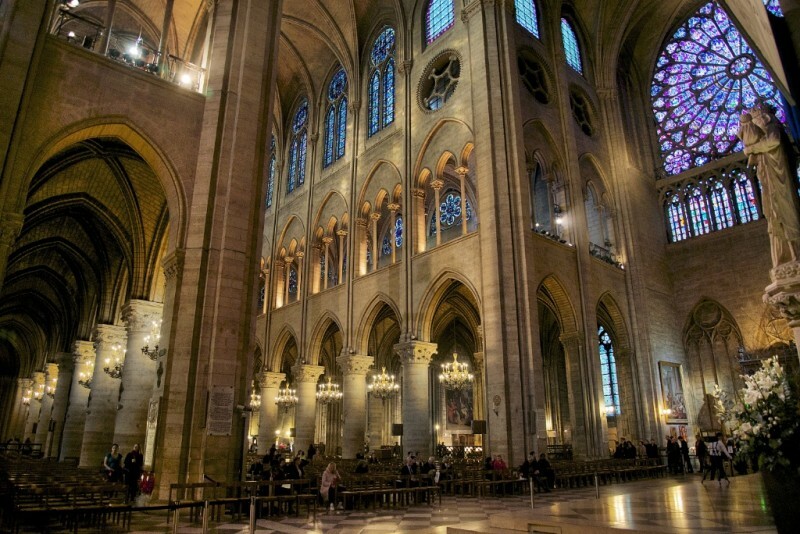 Sad, I was in the cathedral in January of last year, at least I saw parts of it before this fire happened. It's a shock. Yeah sadly i have to say its gone forever what i believe is that the fire department s main goal here is keeping the fire within said building and not spread to other nearby buildings. The spire is located in the center of the cross-shaped cathedral. So the damage will be in the middle of the cathedral where it can do the most harm. This area is located near the top of the cross shaped design, in the far back. So, it's possibly not as damaged as other areas. 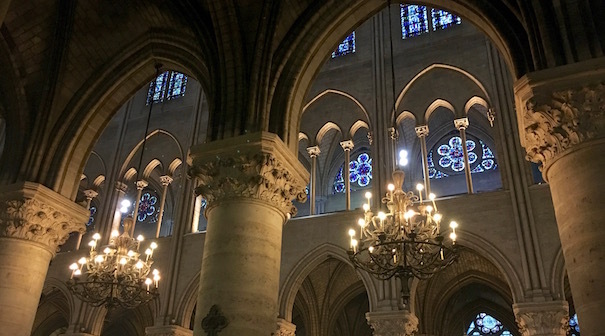 Most of the internal architecture of Notre Dame is stone, which will hold. The roof is wood with metal cladding on top. Some of the stained glass widows in wooden frames covered with iron will likely be damaged. As will any wood within reach of the fire, the belfry for example and the arrow or tower. The buttresses are stone, with wood in some places. I suspect a great deal of the cathedral will survive. Looks like the North Tower may now be on fire from the inside. No evidence or comment that this fire is in any way under control. If both towers go, I suppose the only thing that may be left will be stone facade. Sadly with this kind of fire, all that open space inside with such a high combustion load serves to act like an oven of sorts. Sure to destroy everything that can burn from the inside out. Where did the fire come from? Way too early to determine. But there was a whole lot of renovation going on at the time. No telling how many combustible building materials may have been stockpiled inside. I hope that incredible entrance isn't damaged. The front left tower is already burning from the inside on several floors.